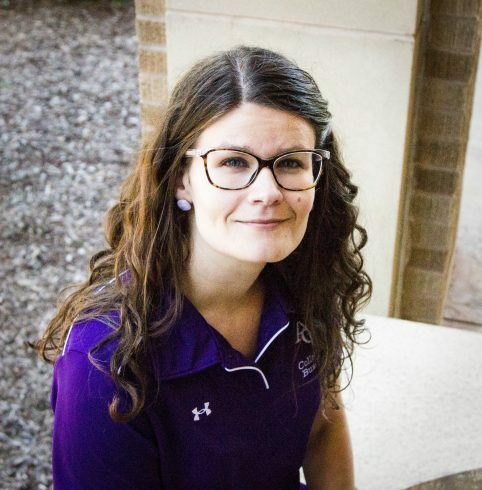 Dr. Sarah Easter is a professor in the College of Business Administration and teaches classes like Strategic Management, Business and Sustainability, and International Business. Over the summer, Dr. Sarah Easter attended the Academy of Management (AOM) Annual Meeting: a professional association for over 10,000 management and organization scholars whose mission is to build a vibrant and supportive community of scholars by markedly expanding opportunities to connect and explore ideas. The theme of this year’s AOM Annual Meeting was ‘Improving Lives’ and specifically focused on how organizations can contribute to the betterment of society through elevating the health and well-being of those who live in it. In her dissertation research, Dr. Easter conducted a sixteen-month ethnographic study of a coalition to end homelessness in Western Canada. The coalition involved over forty different governmental, business and nonprofit players and she examined how they worked together toward common goals while considering many different perspectives. Dr. Easter presented a paper over one of the key findings of this research and received the Best Paper Award based on a Dissertation from the Managerial and Organizational Cognition Division of the Academy of Management. 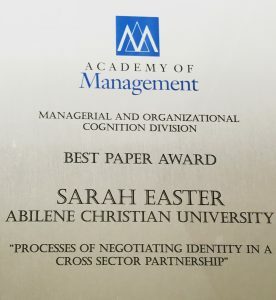 Dr. Sarah Easter was presented with the Best Paper Award for processes of negotiating identity in a cross-sector partnership. Dr. Easter’s dissertation research centered on the challenge of the coalition: developing a cohesive and unified identity (i.e., its focal purpose and goals) in the face of a variety of different perspectives. Those involved in the coalition had many different viewpoints on what the central issue they were working to address entailed, which was homelessness. Even though all participants talked about the notion that the overall vision to end homelessness was well understood by all involved, the result was that the partnership was often pulled in multiple directions simultaneously. The findings speak to the importance of such collaborative partnerships as being very explicit in terms of the vision they are working to achieve. This involves having ongoing discussions and check-in points to ensure that all players are able to clearly articulate the direction of the partnership, including underlying meanings of terms utilized, particularly as participants are continually cycling in and out. Dr. Easter was fascinated in learning how a diverse body of organizations and individuals from public, private and nonprofit sectors come together to address a significant societal issue over time and was able to develop a deep understanding as to how the coalition evolved over time in the presence of many and very different ways of working. Dr. Easter took special notice of the pull between both opportunities and challenges that organizations face in carrying out their work while conducting her research. This is something she emphasizes while teaching classes like Strategic Management, Business and Sustainability, and International Business. “I believe strongly that it is important to consider both dimensions in order to develop a more holistic perspective of a given organization’s current situation,” Dr. Easter emphasized. “I bring up this example in my courses: an organization that has incredible potential to make an impact in addressing homelessness in the local region (opportunity). At the same time, though, there are incredible challenges associated with this complex structure.” Dr. Easter continues a passion for studying how people work across cultural and socioeconomic structures especially through addressing major societal challenges and looks for ways to connect with people and organizations as well as share this passion with her students in the classroom.